Creating your perfect landscape can be a project that lasts a lifetime, but how can you effectively design your outdoor living area when your needs, activities and preferences may change over the years? Fortunately, with a little careful consideration, you can create a functional and beautiful landscape that all generations of your family will enjoy. By thoroughly understanding your landscape before you begin redesigning an outdoor space, you can effectively plan proper landscaping that will thrive rather than struggle. Once you know what you already have to work with in your landscape, you can assess what your needs are for an outdoor living space and how you can create a fun and enjoyable sanctuary in your yard. The needs of toddlers, teens and adults can be very different, however, and it is important to note how preferences may change in the years to come. By thinking ahead, you can make full use of your landscape through different life and family stages without needing to redesign the yard every few years. Consider your family size and how it may change, including whether family members may move away or move closer, whether different family members may be interested in different outdoor activities and how changing schedules may affect how your landscape is used over time. There should not only be enough seating for the entire family to share, but also for entertaining. This might include casual kids’ parties, summer barbecues or more formal events such as a graduation party or bridal shower. While you may not have a seat for every guest over the years, be sure there is space to add additional seating for special events if needed. From garden tools and children’s toys to sports equipment, patio cushions and outdoor holiday decorations, there is always a need for more storage related to your landscape. A shed is a good option, or integrate storage areas that will serve multiple purposes such as built-in storage benches or bins that are part of the patio or deck design. If you want a productive, delicious garden as part of your landscape, opt for adjustable gardening areas such as raised garden beds, container gardens or vertical gardening spaces. 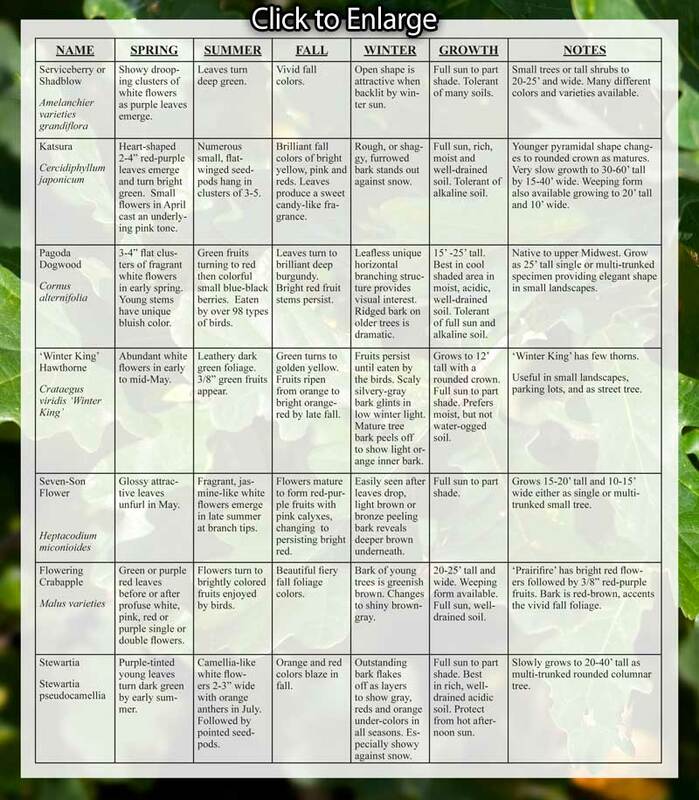 These types of gardens are more easily adjusted over the years as your desire and needs for fresh produce changes, as well as being more adjustable for garden care. 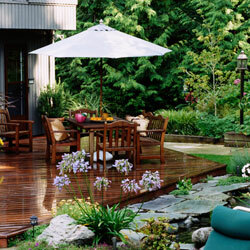 Plan activity areas in your outdoor space that can be modified over the years to meet different needs and preferences. A play structure in an open area, for example, can be removed when young children outgrow it, and that same area can become a badminton court for the whole family. A fire pit area, yoga space or meditation niche can also be adjusted through the years. Getting from one area to another in your yard should be easy for everyone to navigate. Broader pathways will be easier for unsteady youngsters as well as seniors with mobility assistance, and shallower steps are easier for feet of all ages. Be sure paths are level and even, and plants should not overgrow busy traffic areas. If you enjoy entertaining in your yard, be sure to incorporate gathering spaces for groups to enjoy. This might include a fire pit with conversation seating, a grilling area with good access to tools and supplies or even an outdoor kitchen for more elaborate parties. Proper lighting or a speaker system for music can also be essential for an outdoor entertaining space. You will want to see your outdoor living space and enjoy it even after the sun goes down. Pathway lighting, spotlights on focal points and fun string lighting or outdoor chandeliers in entertaining areas can all be part of your lighting design to keep your outdoor space functional as well as festive after dark. Always consider privacy when designing your outdoor living space, not only from nearby streets or neighbors’ yards, but also from different areas of your yard. Be sure there are good sightlines where necessary, but also consider cozier niches where individuals or smaller groups can feel more private. Plants, screens and lattices or trellises are all good options for enhancing privacy. 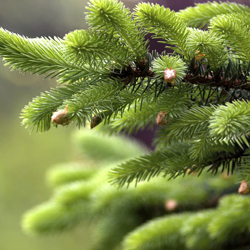 Choosing plants for your landscape is easy when you consider not only your own future needs, but the future needs of the plants as well. 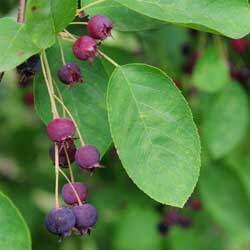 Note the mature sizes and growth patterns of plants when placing them in your landscape, and consider how much maintenance they may require over the years to be sure you can give them the care they require even as your life changes. 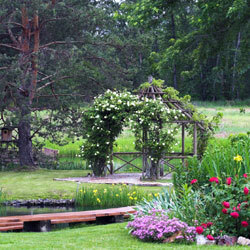 Focal points can unite your landscape and bring it together visually, even as your needs may change. An eye-catching specimen plant, for example, can become the backdrop for family events and photos, and these familiar sights will always be welcome to your family even as its composition changes. No matter how your outdoor living space may need to change over the years as your family and its preferences change, you can plan a versatile, adaptable space to change with your family. What won’t change, however, is how much you can enjoy that space and how it will bring your family together for many memorable moments. Need help planning the perfect landscape for your family’s diverse and changing needs? 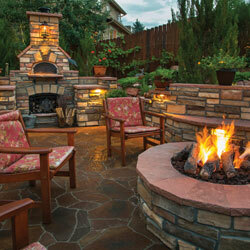 Our experts can help you craft outdoor living spaces you will enjoy for years! 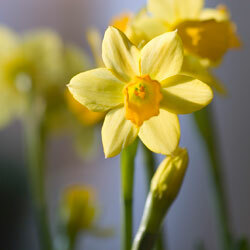 No matter what you grow, your garden does not have to be a bland, predictable space. With careful planning, it is easy to create depth and character in the garden to reflect your personal flair and the enjoyment you find among your flowers, fruits, vegetables and herbs. Before planning your garden to enhance its depth and character, it is important to understand the different levels of space you have to work with. Your garden’s location, size and shape, as well as the overall layout, are part of these levels and can help you plan the best design to reflect your personal style. Foreground – The front of your garden, including borders, edging, fences, and entryways, as well as the first plants a visitor encounters when stepping into the space. 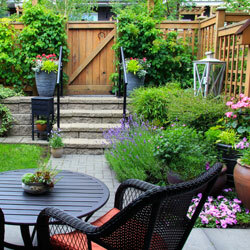 Visually, this area is the welcome to your gardening or landscaping space. Middle Ground – The bulk of the garden or landscape, the center or middle areas. This will include most open spaces and the most heavily used parts of your garden, those that are accessed and admired the most. Background – The furthest, rear point of your gardening space, that provides a backdrop or endpoint for the design. This can include rear fences, walls or property borders and is the stopping point for your garden. As you design your garden, each of these areas can be enhanced to create a more aesthetically pleasing space and an overall design rich in texture, color and creativity. Tiers, with taller plants at the back and shorter plants in the foreground, expand the space and give it a better scale. 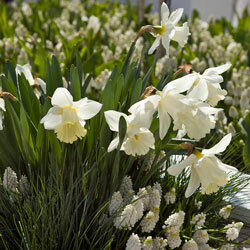 Taller plants can be added in corners or at the sides, with shorter plants filling in the center. Terraces, containers and raised beds can all create tiers. Warm colors, such as red, yellow and orange, are bold and filling, and are best used at the front of the garden to create a welcoming flow. Cooler tones, such as greens and blues, are best in the background where they recede from the eye and give an illusion of greater depth and openness. Gardens and landscapes look smaller when they are uniform. Textural contrasts, however, break up sightlines and add more visual interest, enhancing depth. Opt for finer textures and airy plant structures to increase depth in the middle ground and background, while fuller, more compact textures are best in the foreground. Positioning larger, taller plants in the background and reserving smaller plants for the foreground of your garden will enhance its depth. In small gardens, dwarf or miniature plant varieties immediately create greater depth and make the space seem more generous. Adding a secret space will create depth as it draws the eye into the landscaping design and encourages more detailed examination of the area. 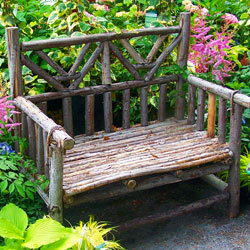 Meditation niches, cozy benches or swings, or other places invite more interest in the garden and improve the depth. Just like a mirror creates more depth in a small room, reflections create more depth in a garden. Gazing balls, reflecting pools or mosaics are great options, but be sure there are no overly focused reflections that might damage nearby plants with excess glare. If your garden overlooks a dramatic view, such as a mountain range, ocean cliff or adjacent park, take advantage of that view for more personal garden depth. Avoid blocking the view, and instead frame it to draw the eye deeper into your space. Taking your garden vertical with climbing plants on a green wall, trellis or other support is a great way to increase depth and add more gardening space. Many vegetables and flowering vines can easily be trained to grow vertically. 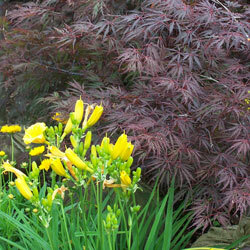 Unusual plants create a focal point in your garden and draw the eye into the space. 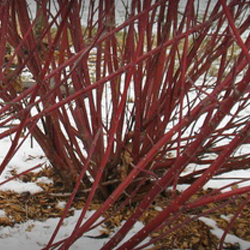 Even in a veggie garden or berry patch, an unexpected specimen can be an interesting feature. Give your garden extra flair by incorporating unusual shapes, such as topiaries or plants with unexpected foliage or flower shapes. 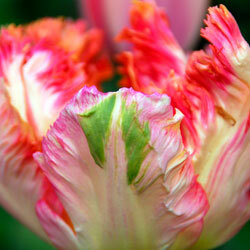 This extra texture will also enhance the garden’s depth. Gardens and landscaping don’t need to follow straight lines. Help your landscape flow with curved garden rows, curving beds or other smooth, elegant lines. Bare spaces cause a disjointed look in the garden, but you can easily fill in patches with extra herbs, flowers or ornamental grasses. This will add even more texture and interest to the area. Welcome visitors to your garden with a fun, customized gate, quirky arbor or unique archway. This feature will draw the eye and encourage visitors to enter and enjoy the space. 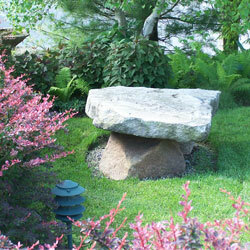 Get creative with curbing to border your garden area with personal flair. Instead of predictable options, choose colored curbing or add accents such as glass bottles or stepping stones. Welcome wildlife to your garden to add life to the space. 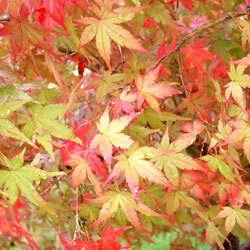 Bird feeders and baths, a butterfly, bee or toad house, or even a koi pond can bring movement and life to your garden. There’s always room in the garden for a surprise or two. It might be a hidden gnome peeking out at guests, scattered sunflowers that grow through other plantings, exotic edibles or flowers with potent perfumes to lure guests in to seek out the surprise. You can add depth and character to your garden in many ways. If you aren’t sure just how to go about personalizing and enhancing your garden, ask our experts for help to create the garden of your dreams! We have all used focal points in our daily lives, from showcasing favorite photos in a gallery wall to throw pillows adding a pop of color on the sofa to choosing accessories to highlight our best features. But did you know you can use landscape focal points in a similar way, drawing the eye to the very best features of your home and property to accentuate its unique characteristics and highlight its beauty? Learn how to truly showcase your landscaping with the best focal points to give your home extra flair. 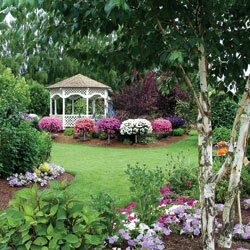 A focal point can be anything unique, whether it is a naturally-occurring feature of the existing landscape or something you have dreamed of adding to your yard or garden. While a focal point initially draws the eye, it actually does far more than just attract attention. A well designed landscape will work with focal points to bring order and dimension to the yard, centralizing the view and directing guests’ viewpoints. A focal point can add character to the yard as well, whether it creates a sense of natural elegance, adds a chic, modern touch or even introduces a bit of whimsy to the landscape. Focal points can also help distract from less aesthetically pleasing views, such as drawing attention away from a neighbor’s yard, minimizing the appearance of a trouble spot or redirecting sightlines away from a utility box or air conditioning unit. Which focal point you choose for your landscape will depend on several factors, and you want to consider each one carefully when planning to use a focal point. 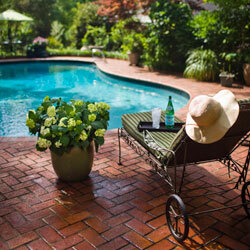 Yard Size: The focal point should be proportionally sized to the yard. A too-large focal point will overwhelm a small, intimate yard, making it seem more crowded and cramped, while a too-small focal point can be lost in a larger space. 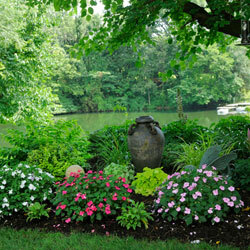 Landscape Style: A focal point should coordinate with the style of the yard and garden. A cozy cottage garden can look great when focused around a romantic statue or elegant bird bath, but a stark obelisk would look out of place. 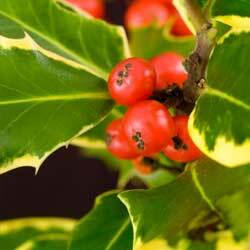 Seasonal Changes: Ideally, a focal point will remain attractive and eye-catching throughout the year, even with seasonal changes in nearby plants and light levels. Opt for a focal point that can be enjoyed year-round for the best results. Viewing Angles: A good focal point will draw the eye in a pleasing way no matter where it is viewed from, including different angles, windows or approaches. Paying attention to every viewpoint will ensure the focal point serves its purpose however it is viewed. Once these factors are considered, a landscape may have one or more focal points. So long as they are balanced and appropriate to the yard’s design, they can be beautiful features that will be stunning highlights in the landscape. Paying attention to symmetry to draw the eye to the focal point. You may opt for a completely symmetrical, geometric layout to lead the eye to the focal point, or choose a deliberately asymmetrical design that builds dramatically to the focus. Coordinate colors, plants and other features to work with the focal point rather than contrast and detract from it. Coordinated colors, shapes and textures – even when used in variety – can add to your focal point and enhance its beauty and drama. Highlight the focal point without blocking it from view, particularly when considering views from different angles and in different seasons. 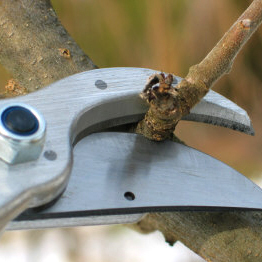 This may include regular pruning and other care to keep the surrounding landscape in check. Keep the focal point in good condition so it is not a disappointment when it draws the eye. 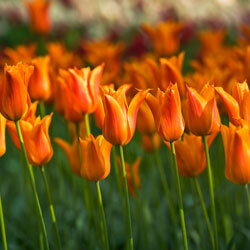 Plants should be properly pruned and shaped, while statues and other accents may need regular cleaning. Structures may need regular repairs or repainting to look their best. Consider muting nearby landscaping features to further highlight the focal point. Opt for more subtle plants and fewer accents away from the focal point to ensure no other areas of the landscape compete with the intended focus. Design pathways, borders and lighting to highlight the focal point and draw attention to the appropriate space, both visually and physically. This will keep your focal point centralized in the landscape at all times, serving its purpose as your landscape highlight. A focal point is more than just a highlight of your yard, it can become the centerpiece of your landscape, set the mood for your outdoor space and showcase the beauty of your home. Working with a focal point can help you draw together the entire space in an eye-catching way you’ll always be proud to see. 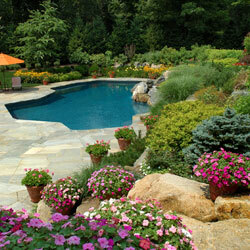 Want to design your landscape around an appropriate focal point? Our design experts can help you choose just the right focus and create a stunning look to highlight your landscape’s best features! Redoing your landscape, whether you are starting from scratch, updating parts of an existing design or completely renovating your yard, can be a lengthy and expensive process. Phased landscape installation can help you adjust your time, labor and budget to create your dream landscape in easy-to-manage steps. Instead of doing an entire large landscape at one time from start to finish, phased landscape installation breaks the project into more manageable pieces. It may take several weeks, months or years to complete the landscape installation in phases, depending on the size of the project and what resources are available to complete it. 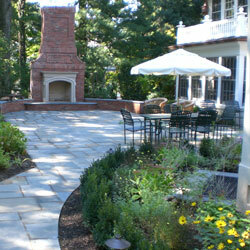 Phased landscape installation can be beneficial in several ways. Not only does it make a large project more manageable, but it also allows for tweaks and refinements throughout the process as needs, preferences and living styles may change over time. Installing a landscape in phases can also better accommodate a limited budget or limited time with shorter seasons, while still allowing for the yard, garden and landscape to be used and enjoyed before the full project is complete. 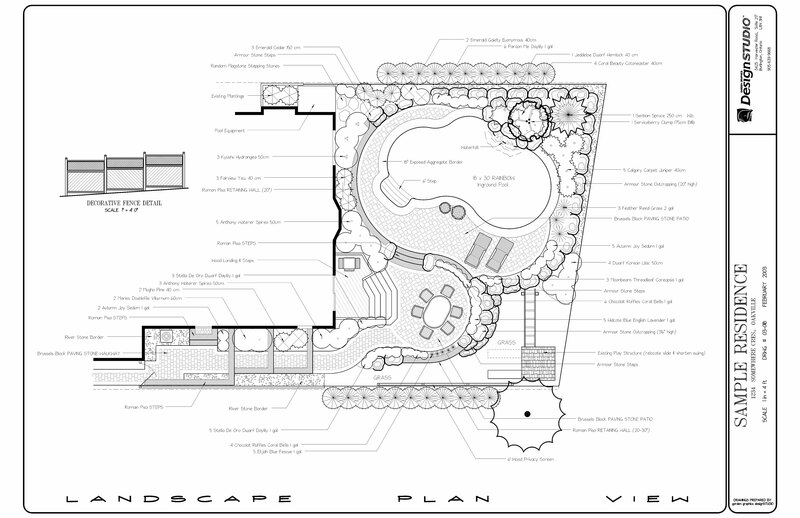 Creating a master landscaping plan is a critical first step in phased landscape installation. A master plan is necessary to keep the landscape’s end result in mind, and that plan can be adjusted as needed throughout the different phases. When the full project can be envisioned, it is also easier to plan the order of phases to be installed with the greatest efficiency so there is less disruption to established parts of the landscape when a new phase is begun. The first part of a master plan should involve a comprehensive evaluation of the site and its landscaping needs. This should include soil condition and quality, drainage concerns, sunlight levels, potential erosion problems and more. This evaluation can help direct the landscape installation to correct difficulties with each step. After the overall evaluation, the first phases of landscape installation need to be sufficiently detailed for the project to get underway. Later phases and finishing touches may change by the time the final phase of installation is ready to begin, and so those phases may not necessarily be as firm when the landscaping plan is first developed. It is important to keep the master plan accessible, especially when it may take several years to fully install a larger, more elaborate landscape. Notes, changes, suggestions and updates should all be documented. This will ensure that all contractors and experts – who may change over the years – are aware of the overall landscape vision. 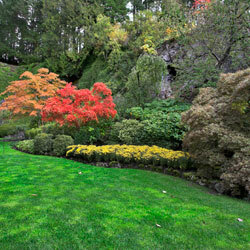 Surfaces – Sod, seeding, groundcovers, or mulching for erosion control and visual appeal. Hardscapes – Borders and edging, terraces, retaining walls, etc. Gas and Electrical Lines – Support for water feature pumps, lighting, outdoor kitchens, etc. Irrigation – Sprinkler systems and drip plans as well as drainage adjustments. 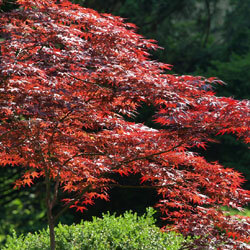 Shade – Large trees and plants to provide shade for outdoor living spaces as well as structures. Entertaining Space – Patios, decks, pool surrounds and similar high use spaces. Structures – Pergolas, trellises, arbors, sheds, play structures, etc. Waterscapes – Ponds or pondless waterfalls, creeks and streams, or fountains. 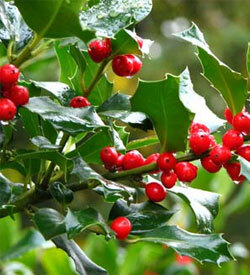 Garden Space – Raised beds or dedicated growing areas for practical harvests, fruit trees, etc. Pathways – Connections between parts of the landscape or around the entire home. 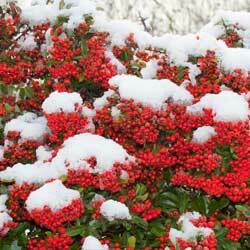 Plantings – Shrubbery and flowerbeds, specimen plants, etc. While the order of phase installation can vary greatly, many plans opt to put surfaces, hardscapes and shade early in the master plan. Surfaces are often used right away and help a landscape look attractive even as the plan is being implemented, while hardscapes establish the borders that will gradually frame the entire landscape. 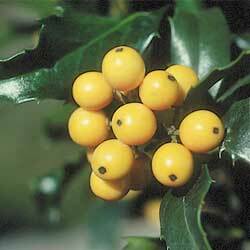 Shade is also important to implement early, as larger trees have slower growth cycles and will take longer to mature and provide their full benefits, so the sooner they are planted the sooner they will be providing that shade. Of course, depending on the exact budget and master landscaping plan, several phases may be implemented at once, or smaller phases may be spread out over a greater period. In addition to these potential phases, it is important to consider the final phase of landscape installation – care and maintenance. Particularly when plants are young and the ground may still be settling, extra care may be needed to nurture plants and ensure they adjust to their new environment. Proper care, including pruning, fertilization and pest control, will help keep the landscape looking just as attractive and inviting as it is from the first moment of installation. Are you considering phased landscape installation? 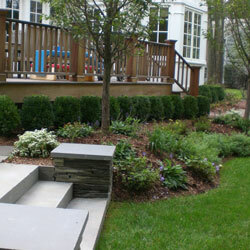 Our experts can help develop your master landscaping plan and recommend the best phases to create your dream landscape!